A single transformer may not meet all your requirements, especially if you are setting up a large or complicated workspace. In these situations, you will need to use a combination of transformers. 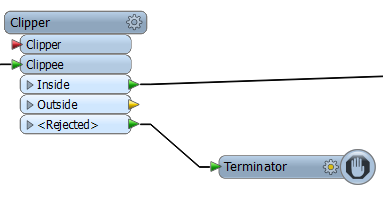 A string of joined transformers graphically represents your overall workflow and is a key concept of FME. Many transformers contain a <REJECTED> output port. Features that are not compatible with the transformer are output through this port (for example, if they have the wrong geometry type or are otherwise invalid). To stop a translation, add a Terminator transformer to that port. To log bad features, add a writer, or a Logger transformer. To continue, and keep the rejected features, just connect the <REJECTED> port to the next INPUT port. Not every transformer has a REJECTED port (and some do not need it).